Our vacation rental condos in Sanibel Harbour feature stunning sunset views from your 6th floor screened-in balcony furnished with a table that seats 4 and a settee to relax while overlooking Sanibel Island. 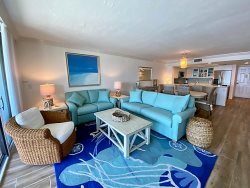 This tropical Sanibel Harbour Towers Vacation condo has an upgraded kitchen that allows for bar stool seating in addition to the dining area. The sofa sleeper in the living room allows for extra sleeping accommodations and offers ample seating with two sofas and chair. The oversized Smart TV in the living room can be seen from the kitchen, dining area and the patio with just a tilt in your direction. The master and guest bedrooms have Queen beds and large flat screen TV's in each room. You may have found this rental on HomeAway 4132756, HA ID 4132756, VRBO 4132756ha or Vacation Rentals 4132756. It was a beautiful, spacious condo and the view from the balcony is amazing. A perfect location with Sanabel and Captiva Islands just beyond the causeway. We thoroughly enjoyed the beaches, the wildlife, the dining - so much to do in the area. Check-in/check-out is so easy - just a wonderful relaxing trip. Thank you. My husband and I travel to Florida for vacation every year and have been doing so for the past 10 years or so. This was by far our most enjoyable, relaxing vacation EVER! The location is AMAZING and there is near by shopping, a beach right out the back door, a pool, restaurants and salon in walking distance. Our 3 year old son had a great time playing on the beach, my husband went fishing off the near pier. We all enjoyed every second of our experience and hope to make this a regularly scheduled (yearly) trip. Except for the person I spoke to at emergency services, we did not interact with any other team member. I would stay here again in a heart beat. The location is convenient to grocery and other stores, and has easy access to Sanibel/Captiva. The condo was beautiful, the view was breathtaking. We loved the peace and quiet of the property. Neighbors were friendly. I would rate this property a definite ten out of ten! Everyone was very friendly, accommodating and helpful! Our visit to Florida and Resort Harbour Properties surpassed all of our expectations! We were very comfortable throughout our stay whether relaxing poolside or exploring the beauty of nearby Sanibel and Captiva. Amazing place! The property and views are amazing. Quiet space, great location. Easy to get in and out and close to whichever beach you want to go to. Harbour Tower 615 was excellent. Have stayed in many units over last several years. Had stayed in this unit before and would return here again. Everyone was very helpful and accommodating! We were really blown away by the property overall, the unit and the views! We will absolutely be back- I rarely fill these out after a stay but I had to comment on how much we enjoyed this property and the unit! Exceptional!